It is important for dog owners to learn the symptoms of kennel cough in order to seek appropriate veterinary treatment. Without medical attention, some forms of kennel cough can develop into a potentially life threatening illness. While coughs can indicate a number of different canine health conditions, kennel cough has a specific set of symptoms. Kennel cough, aka canine infectious tracheobronchitis, is a contagious respiratory disease that can affect dogs of all ages. The airborne infection spreads when a dog comes in contact with another infected dog. The condition can be caused by a viral or bacterial infection. 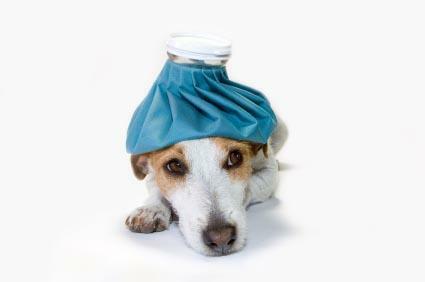 Many types of viruses and bacteria can cause the same symptoms in an affected dog. How Long Does Kennel Cough Last? Bordetella bronchiseptica is the most common bacterial cause of kennel cough. Bordetella is related to the bacteria that causes whooping cough in human beings. Viral causes of kennel cough include canine parainfluenza virus and canine adenovirus-2. The primary symptom of the condition is coughing. The viral or bacterial pathogens interrupt the normal function of the upper respiratory tract. The pathogens temporarily destroy the protective cilia lining of the trachea, larynx and bronchi. When this occurs, irritation causes coughing and the infection may move deeper into the lungs. Kennel cough symptoms generally appear about three to four days after the dog has been exposed to the infection. Some dogs may not show symptoms until eight to ten days after exposure to the disease. Each case of kennel cough is unique, and not every dog will exhibit each symptom of the condition. A dog with a mild case of kennel cough will have a persistent dry cough, but may still be active and eating well. These dogs typically improve within five days after exhibiting symptoms and may completely recover within ten days. In fact, mild cases of kennel cough may not require any medication. Yet, sometimes a dog will not improve within five to ten days and will, instead, develop more serious symptoms. A dog with these symptoms needs veterinary attention to recover. If left untreated, the Illness could progress to pneumonia. Veterinarians may prescribe cough suppressants to alleviate coughing symptoms. Bronchodilators and decongestants are also used to assist dogs exhibiting serious upper respiratory infection symptoms such as narrow passageways and lung congestion. The veterinarian may also prescribe antibiotics, especially if a secondary infection is suspected or if the lungs are congested. Symptoms appear after the dog has spent time with other dogs such as in a kennel, doggie day care or grooming facility. The persistent cough occurs randomly, but it may also be triggered by exercise, excitement or any pressure on the neck area. The deep, dry cough sounds as if the dog has something stuck in her throat. The coughing fits are loud, forceful and generally last a few minutes. The fits occur frequently. Coughing fits sometimes cause the dog to retch a white, foamy discharge. A dog owner who suspects kennel cough can also very gently press her dog's throat in the area where the collar rests. If the light pressure causes the dog to cough, throat irritation is present. The throat irritation may indicate kennel cough. A number of health conditions share similar symptoms to kennel cough. Any dog owner with a dog that presents the symptoms of kennel cough or any other respiratory disturbance should consult a veterinarian. A veterinarian can determine the appropriate diagnosis and course of treatment. Early treatment can prevent serious health complications.